6 Dram Green Vial with Push & Turn CRC Cap | U.S. Plastic Corp. These vials have a two-piece push and turn cap that is child resistant. The vials are made within USP "Tight" specifications. They offer a safe but simple design. Just push down on the cap while turning for easy opening. The cap is securely closed when you hear a snap while turning. Vials are available in amber, blue, and green. They come complete with the two-piece child resistant push and turn cap and they meet "Child Resistant" protocol. 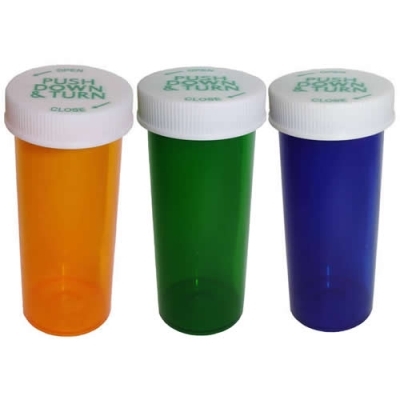 Rx Label Length: 2.19", Total Length: 2.6", Inside Diameter: .90".